Jason plays bass in Failures' Union and owns/operates a screen printing shoppe called Wooden T-Shirts. He also eats veggie dogs by the gallon. I am a fan of most of the Goya Nectar drinks. 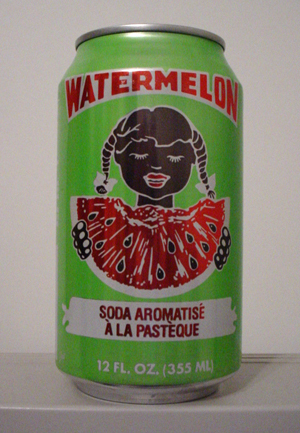 I usually get them in the larger bottles, but this flavor I've only ever seen in a can. I learned today that although the bottles use natural sweeteners, the ones in the cans all seem to be sweetened with High Fructose Corn Syrup. In my opinion that's already deducted points. The taste of the nectar reminded me of a mix of apple and grape juice, with a strange earthy undertone. It really did nothing for me. This bottled beverage taunted me for months from the shelf of my local grocery store. The bottle made it look so fancy and tasty. I thought of it as the grail of beverages. The $8 price tag on it always deterred me. I would look up at it weekly and say "Some day. Some day." Finally I got to the point where I couldn't stand it any longer and bought it to have with dinner that night. This drink had been built up in my head to such a level that I cannot describe my disappointment as it splashed on my tongue. It tasted like the blandest fruit juice I had ever tasted. It tasted the way every health food was described in 80's movies. It also had a strong fennel aftertaste, even though it's not listed in the ingredients. I had a handful of other people taste it, wondering if it had magically powers that made it taste so disgusting to those who weren't worthy of it's glory. After one sip everyone thought it was completely terrible, and half a bottle of it was sadly poured down the drain. 12 Beverage Sparkling Fruit Juice and Tea Blend 25.4 oz. When I saw this intriguing beverage I was pre-warned that this was "completely gross" by a friend who had already been roped into trying it. I was feeling adventurous (and I thought it couldn't be nearly as bad as he said it was), so I decided to give it a chance. Oh how I wish I hadn't. It was extremely bland. The quinoa "supergrain" gives the nearly flavorless beverage the consistency of a grits milkshake. I'm usually a fan of pulp and other floaty things in drinks, but this was just too much. I couldn't even finish a third of the bottle. I wouldn't recommend this to anyone as an everyday drink, but if you're drinking it for the health benefits, I say good luck to you. I'm not a fan of most coffee drinks, but I do occasionally enjoy a mocha. I unfortunately did not enjoy the Cafe Azteca. I guess it remotely tastes like mocha, but it is extremely strong and burns a lot. It wasn't what I expected after having the other Taylor's Tonics drinks. At first I thought it might have been my dislike of coffee drinks that was weighing my opinion, but after having some avid coffee drinkers taste it, everyone agreed it was way too strong for its own good. Out of the seven or so people who tasted it, only one really enjoyed it. I've seen these drinks around a few times, but the $4-$5 price range always deterred me from trying it. When I saw it on sale for $2, I realized it was time to give it a chance. I've had dried mangosteen in the past, and it was pretty decent, so I was looking forward to this. When I opened it, there was brown gunk on the inside of the cap, I checked the expiration date, and it hadn't passed, so I chalked it up to "health food sludge." The smell is pretty terrible, like a fruit that is past ripeness. First swig it wasn't so bad, but it was kind of hard for me to finish the bottle. It reminded me of cider when it's just on the verge of becoming alcoholic. This is definitely not the beverage for me. Youth Boost to Support Healthy Aging and Immune System (1) Bottle 12 oz. Ugh. I have had such good experiences with the other Function flavors I've tried. When I saw a peach mango one, I was so stoked. I didn't even take into consideration that it was "Light Weight." It tastes like nothing but artificial sweetener. I get no specific peach or mango flavor. It starts off with a general fruit flavor, and quickly turns to sucralose hell. If you are an alien and love the taste of artificial sweeteners, this may be right up your alley. I will be steering clear. Unfortunately I bought another flavor of "Light Weight" that I still have to review. Imagine the following. It's Thanksgiving. Everyone has just sat down for a wonderful traditional meal. Suddenly your crazy aunt comes in and pours eight gallons of pureed prunes on everything. That is exactly what Malta Goya tastes like to me. It is the worst beverage I have ever tasted in my life. Years ago, when I first moved into my current apartment, we had a taco party. Someone thought it would be a good idea to bring a case of this. We all in turn thought it would be a great idea to all chug them at the same time. I then spent the next hour laying on my bathroom floor cringing in pain. I didn't even get another one of these to drink while I wrote this review (which is how I normally do it). It's that bad that I never want the flavor on my tongue again. I wish I could give it a negative rating. Like this beverage, my sister's boyfriend is from Puerto Rico. I guess people drink it down there like crazy. They can't get enough of it. I can't even come close to understanding that. Look at that can. Isn't it just adorable? It’s a fresh young boy just digging into some watermelon. Look at his two teeth just ready to fall out, and the big smile on his face. He loves it so much that he's never been happier. Then unfortunately you have the other version of the can here: OUCH! Wow! That is just terrible. After getting over that racist can (which I don't know if they still make), here is a description. It smells and tastes just like a watermelon Jolly Rancher. Oddly it has an aftertaste of those Violets candies. It kind of tastes like a soapy old lady would in my imagination. Not a fan of the alternate can or the flavor at all. I guess this energy shot could be considered a drink. It tasted like Red Bull mixed with poison; a complete chemical flavor. So gross. Not for me. If you need to drink a Red Bull go for a regular one, they taste way better.